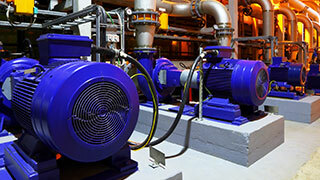 With the IoT, every electric motor on a factory floor is equipped with one or multiple sensors that are connected (preferably wirelessly) to a control database that continuously collects data about the motors. This is the 4th article in a 5-part series looking at the impact of the Internet of Things (IoT). Let’s look at an example of electric motors in industrial environments and the ways the IoT produces some real value, perhaps in some ways you hadn’t considered. 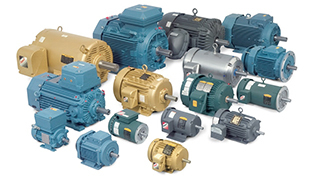 Electric motors come in all sizes, from very small to very large. They usually run on main power, but sometimes on batteries, like in electric cars. We all have many electric motors in our homes — in our vacuum cleaners, fridges, freezers, garage door openers. And, of course, many toys have miniature electric motors, like the locomotives in model trains. Factories are also equipped with many electric motors used for all kinds of jobs: lifting, pressing, pumping, sucking or drying — basically everything that can be done with motion. 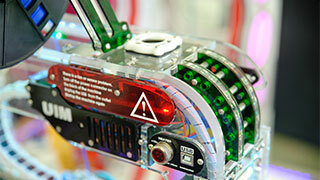 Electric motors are the workhorses of industry today. They’re also used in areas that are too dusty, dangerous or difficult to reach by human effort. In short, modern industrial life doesn’t exist without the electric motor. Electric motors are mechanical devices, so it’s no surprise that they go down occasionally. Statistics show a failure rate of 7% per year; on average, an electric motor stops working once every 14 years. Not bad, you might think — but for a factory with a hundred electric motors, that means one motor is down just about every month. And keep in mind that one motor going down sometimes means a whole production line going down, which can become very expensive, very quickly. Now factor in the reality that motor failures can come with incredibly unfortunate timing, like just before that critical order has to be delivered. Preventive maintenance. Maintenance schedules are based on an estimate of how long the average electric motor runs. To be on the safe side and avoid complete motor failure, maintenance usually occurs too early (although occasionally too late), and well-functioning parts still in good condition may be replaced. The catch? There’s no guarantee that a new problem won’t occur shortly after maintenance takes place. “Run-to-failure” maintenance. This approach waits to do maintenance until the machine stops working. This typically results in full motor replacement, because repairing a rundown electric motor on the spot usually isn’t simple. Condition-based maintenance. Before electric motors go down, they generally start to show irregularities like noise, imbalance, drag, etc. In a condition-based approach, a maintenance specialist goes to every electric motor and “listens” to it with the appropriate tools, much like a doctor with a stethoscope. Depending on the environment, this may be an easy job or a difficult and even a dangerous one. And, of course, the doctor can't be everywhere at once. Despite its drawbacks, preventative maintenance is probably better and more cost-effective than the “run-to-failure” alternative — but condition-based may be a better option … especially when you bring in the IoT. With the IoT, every electric motor on a factory floor is equipped with one or multiple sensors that are connected (preferably wirelessly) to a control database that continuously collects data about the motors. The control database can use artificial intelligence (AI) to learn normal behavior for every motor and then, after a typically short period of learning, it can generate immediate alerts when deviations from that normal occur. In other words, the IoT combined with AI not only sees problems coming, it continuously scans for problems. Keep in mind that this control database doesn’t need to be programmed. It can simply be fed with data and then learns by itself “automatically” what is normal and what are exceptions. When an exception (i.e., a problem) occurs, it sends an immediate alert, which in many cases avoids total motor failure and replacement. This kind of smart alert also allows the treatment to match the problem at the moment it starts to manifest, rather than general maintenance that may be too early, too late or miss the pending failure completely. Depending on the severity of the problem and alert, the motor’s downtime can even be planned to minimize any disruption to operations. Finally, this kind of sensor-based data collection is far more precise and thorough than anything humans could achieve. A slow deterioration of the quality of any given electric motor will continue undetected by human eyes and ears until a serious problem develops or failure occurs, but the IoT will notice even the smallest shifts in normal performance over a longer period of time. We think we live in a modern world, but we actually waste a lot of resources and money by making the wrong decisions and/or making decisions too slowly. The promise of the IoT is that we can now collect enough data — cost-effective data that already exists, but that we never captured. And we can capture this data continuously, and quite effortlessly, in enormous volumes. With AI, we can learn from it to make better decisions, faster. Back to the original question, then. What value does the IoT bring? It enables people to make better decisions, faster.